A woman I know paid me the highest compliment of my life last week, and she probably doesn't even know it. It had nothing to do with my writing, or my blooming spring garden -- both things I take great pride in. It actually was something I had absolutely nothing to do with. "Every time I see your daughter, I am amazed at how much she looks just like you," she said. "Exactly like you," she replied. 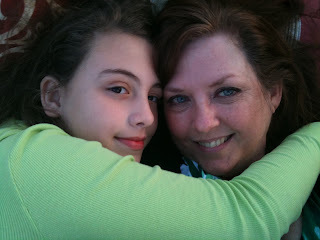 I am amazed that people think my brown (almost black)-eyed daughter looks like blue (almost gray)-eyed me. Sure we have similar colored hair, but hers is natural and mine comes from a bottle every four to six weeks. And she has this gorgeous, dark, olive skin while mine is kind of pasty and blotchy, especially when it's hot outside. And that touches my heart. There is not a drop of my blood in hers, not a smidgen of DNA. She doesn't have my blue eyes or my mother's ears or my father's smirk. She actually looks most like my mother's mother, who was the only brown-eyed child in our clan. But this child could not be more mine if I had given birth to her instead of a wonderful, selfless woman with a strong Native American heritage. She and I, my child and me, we have the same brain. We have the same heart. We have the same vision. We have the same imaginary friends. She and I will spend hours lying in the hammock or floating on a raft in the pool, searching for rabbits and dragons and alligators among the clouds in the sky. My husband? He's looking for rain. She and I will giggle over some silly joke only the two of us get while my husband scratches his head, befuddled. She and I, we speak the same language. And we both use it to tell stories. Does that mean we "look" alike? Does it matter? The infertile woman that lives inside of me spends probably an inappropriate amount of time scanning the faces of my young nieces and grand-nieces and grand-nephews, looking for the telltale signs of family ties and DNA. I look at my sister's young babies and wonder if my child would have looked anything like them. I see so much of my brother in his daughters and his new granddaughter and grandson. I look at my older sister's new grand baby and see nothing but my sister. I can't help but wonder what "my" child would have looked like. Maybe I don't have to. Maybe I need to stop looking. In just a few days, our family will celebrate the anniversary of the day she truly became ours, the day we went before a judge who signed his name to a bunch of papers that made this child my daughter forever. After days of going back and forth over how to celebrate this monumental occasion, which we call "Lora Day" in our family, she has decided she wants a party. She wants to stay home, surrounded by friends and family, to celebrate with pizza and cake. Yes. She is my child.